Small pictures with a blue border will open a new window with a larger picture when clicked. This is it. November, 1998. Beverly saw the dream. 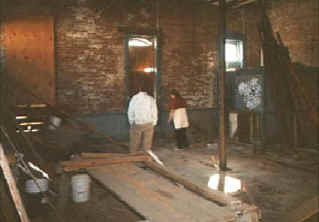 Ken Graham (in white coat) the real estate agent who worked with us to procure this building, was a bit skeptical. 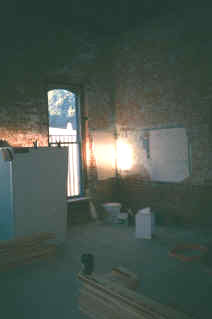 A view of the high class rest room facilities that were in the under renovation Revere early in 2000. 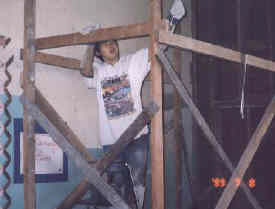 Robert Crawford climbs the scaffolding yet again to help strip lath and plaster from the future office's walls. 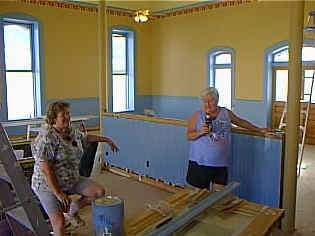 John and Beverly's mom Elsie are stripping trim. 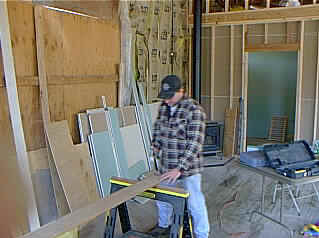 John gets a break from taking and shipping orders to help sand the original trim. The plastic sheeting used a a vapor barrier prior to installing the stud walls. 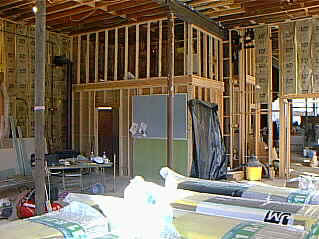 We framed the brick walls with 2x6s so that we could insulate the rooms. You need scaffolding when you have a room with 16' tall ceilings! 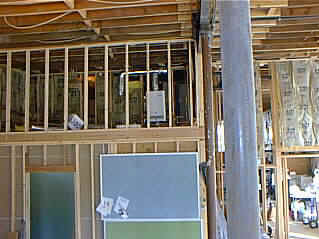 Fall and Winter of 2000 -- Framing in the office area. The door to the rest room is covered with vintage black plastic. Located on "the mezzanine," is the propane on-demand water heater that furnished hot water for the first and second floors. 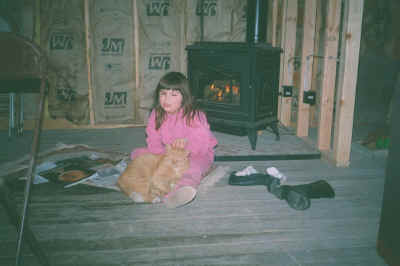 Oliver and Brittany Ann snuggle up in front of the fireplace during the winter of 1999. Building a door, building a wall... It's all the same for Jeremy Jones. Man, that's a tall window. 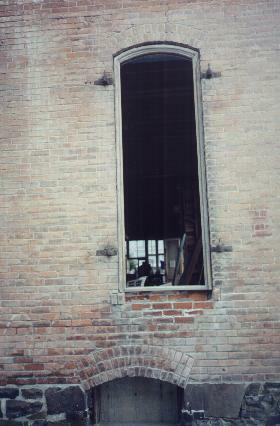 One of the alley windows of the office. 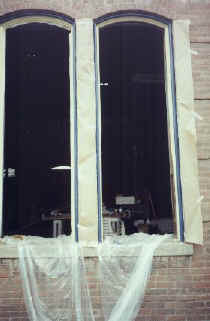 Two of the 7th Street window frames taped, primed, painted, and ready to install the window. 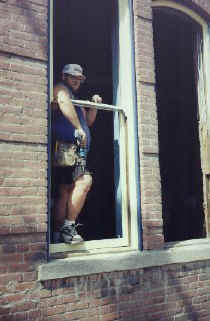 "These windows are a real pain," says Jeff Woolard. 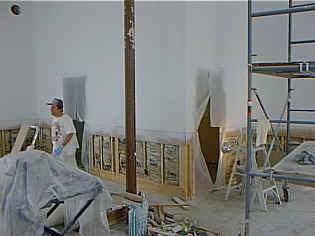 The Summer of 2000 saw the drywall go up. 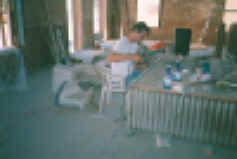 You can see Justin Wilson of Marble Magic who in addition to doing the tile in the bath and break rooms worked with us as a contractor on the Executive Office. 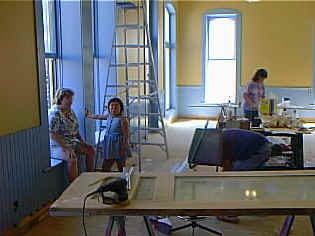 "Ok, Justin," says Beverly (she is on the right), "You've painted the primer coat. Now what about the finish coat?" Zap! Only took Justin and his assistant, John, a day to finish spray painting the walls. 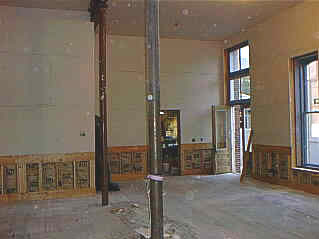 (The steel posts and beam -- visible at the end of the picture -- will be boxed in with wood when done. Justin painted them because ... they were there! Another view of Justin and Beverly. They're probably watching the trucks drive up the alley. 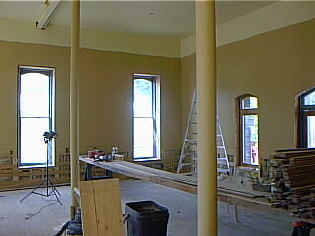 We skip a few days and some pictures as we see the beadboard (wainscoting) in place and painted. 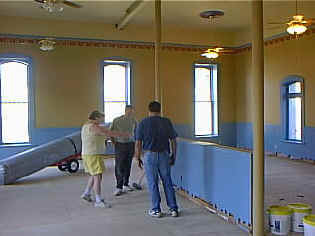 Deborah Hancock (in far view) and Keith Wilber handled painting the beadboard. 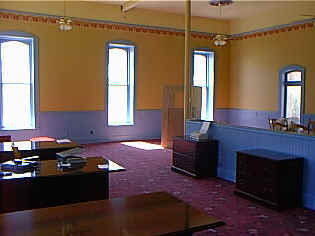 The beadboard was all "salvaged" from this room (in the top picture, you can see it). 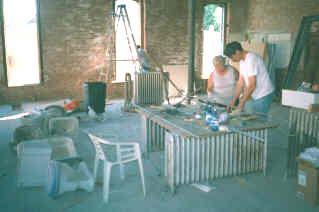 Beverly's dad, Bruce, came up with a way to strip almost all of the old paint off each piece of tongued and grooved beadboard before parts of it were hand stripped. Beverly (still in full torso brace from her recent back surgery) and her mom, Elsie, pause for a bit of a break. Elsie is leaning up against the "pony wall" built by Sam Cavanaugh, Beverly and John's son-in-law. "I don't think that wall was there when we bid this project," recollects Mike Deal, owner of Pomeroy's Home Mart, who provided the carpet for the offices. As you can see by Brittany Ann's gracious curtsey, the beautiful carpet is enjoyed by all. The (somewhat) crowning moment! Part of the furniture is in. 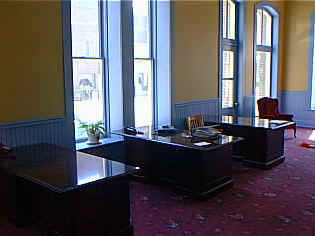 John's and Beverly's desks are, we are promised by Bob at Black and Vails in Lewiston, Idaho, on their way. As we end this segment of the trip, there are two things about this picture. One, there is no desk for John.... The other, you can see in the comparison below.